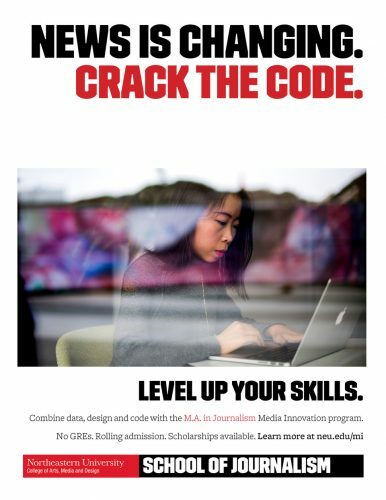 Northeastern University’s new Media Innovation program, a graduate program in digital journalism, is currently teaching an experimental interdisciplinary course in partnership with Esquire magazine. It’s called StoryLab and the class is made up of journalism, computer science, and information design and visualization students. Their mission is to reimagine Esquire long-form features for the digital age, reworking how they look, sound and read. For more on the projects produced last semester see here. And see here for this semester’s syllabus. Dan Kennedy opened our micro-conference with a reference to Clay Shirky’s 2009 blog post on the future of journalism: “People didn’t know what the printing press was going to lead to. We still don’t know what the Internet is going to lead to.” Kennedy thinks local journalism is a smart place to look for innovative ideas, especially those outlets that have found sustainable business models by knowing how and where to engage their audiences, he said, citing The New Haven Independent and The Batavian as examples. 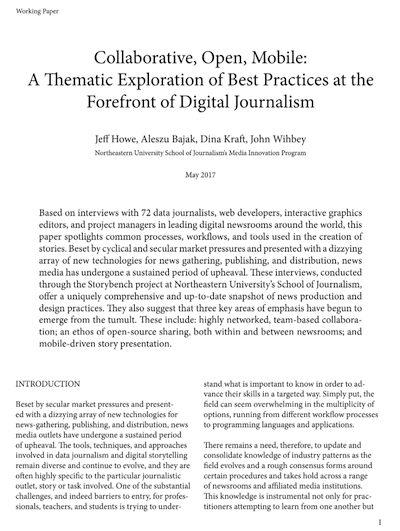 As 21st century technology advances, Josh Vekhter sees journalism changing, in part because age-old questions journalism answered about issues like the weather and which sports team just won a game can now be answered instead by sites like Google. “Where I see journalism heading with computers is answering the questions that no one is asking,” said Vekhter. Journalists once could only rely on experts and their own shoe leather reporting questioning sources to break new ground on a subject, but now journalists can also tap data for answers. Susan Gold told the class about augmented reality and our new tendency to use a second screen to supplement what we are doing, i.e. watching television while surfing the Internet on a mobile phone or laptop. Though Google Glass may be dead, Gold pointed out that augmented reality startup Magic Leap has attracted more than $500 million in funding to shoot a tiny projected image at a user’s retina. It may sound like science fiction, but this kind of technology could fundamentally alter the way people experiencing media, be it advertising, games or journalism. “Games are the medium that have been doing interactivity the longest,” said Nick Fortugno, who Skyped in from New York City. “Humans have been playing games for thousands of years.” This is important for the creator of new forms of journalism and storytelling to understand, Fortugno said. He spoke of the need to understand exactly what interaction is from the audience’s perspective. “If you’re not thinking about interaction as part of the story, then it’s not interactive.” When done correctly, he said, the interaction becomes meaningful to the story and is a vital part in getting across the story’s main themes. Fortugno cited a game he designed called Ayiti: The Cost of Life, a role-playing game made with The Gates Foundation where the player assumes the role of a family in Haiti seeking an education under conditions of extreme poverty. To showcase what the stress of living under that level of poverty, players are charged with managing the family’s money and must make difficult choices about how to spend it. At one point the player sees a house for sale, but working with the meager income it has, the player will realize the family has little hope of ever being able to afford that home or any home. “We wanted the player to consider buying a house. To an American student, which is where this game was aimed, buying a house is an imaginable thing. In the game it’s impossible. That’s designed to showcase a certain understanding of poverty,” Fortugno said. “All of us, whether we are journalists, or documentary filmmakers, or data visualization experts, or programmers, we’re directing attention to solving different things,” Catherine D’Ignazio told the students. D’Ignazio explained that each of these professions are designing for action, whether they know it or not. “Each storytelling act that you do is already political. Not political in the sense of partisan politics, but in the sense of power. It’s powerful to direct people’s attention. Action can follow from attention being directed to places.” At the same time, argued D’Ignazio, we should ask ourselves who is creating a story or a visualization and why. Lily Bui is exploring the role new technologies using sensors including wearables, cameras, and even satellites, are impacting the way people are engaging and thinking about the world around them. She said it’s important to keep the information produced by these new tools as open and accessible as possible for the sake of both journalism and the civic engagement these tools can inspire. Dan Kennedy: What will hyper-local news look like in the future? Josh Vekhter: How do we keep things open, both in terms of the data behind our stories and the tools we use to tell them? Susan Gold: What will the generation coming after you want? Nick Fortugno: What are the user expectations around storytelling on the web? Games get remarkable, fixed, longterm interest. What is the format in which people want long attention span work? Catherine D’Ignazio: How do you go about choosing what you work on? Who is the audience you are designing for? Lily Bui: What are the disciplines that feed into journalism and how do they interact with the process of storytelling?